The shoulder is a complex joint, and figuring out the exact cause of your pain is essential to treating and preventing injuries. This will be the first article in a series of articles about how a physical therapist can help you with your shoulder pain. The scapula, also known as the shoulder blade is a very important, and often under evaluated component of shoulder pain or dysfunction. 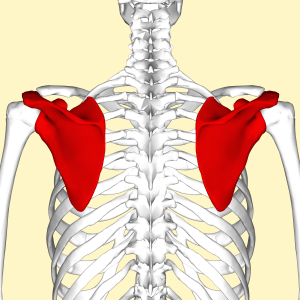 The reason the scapula is important is because there are 17 different muscles that have an attachment to it, and dysfunction in any of those muscles can lead to impaired scapular mechanics or shoulder pain. Scapular dysfunction can lead to shoulder problems like shoulder impingement, rotator cuff pain, or even be the source of pain itself. Sometimes a patient will need manual therapy to help correct muscle imbalances and to improve scapular mechanics. Other times exercises designed to strengthen weak muscles that are involved with scapular movement may be necessary. Generally the best way to correct this problem is a combination of both. By using a combined approached, a physical therapist can use manual therapy to help the patient learn how appropriate scapular movement is supposed to feel, and it will also help the body fire the appropriate muscles at the right time. A targeted exercise program will address the strength and endurance deficits that may have been a cause of the initial problem. The best exercises depend on the physical therapists findings, and the patient’s specific needs. Exercises that target the serratus anterior muscle and the lower trap muscle are usually extremely important. However since there are so many muscles that attached to the scapula, it is important for a physical therapist to determine which muscles are actually weak, and which muscles may be limiting mobility.